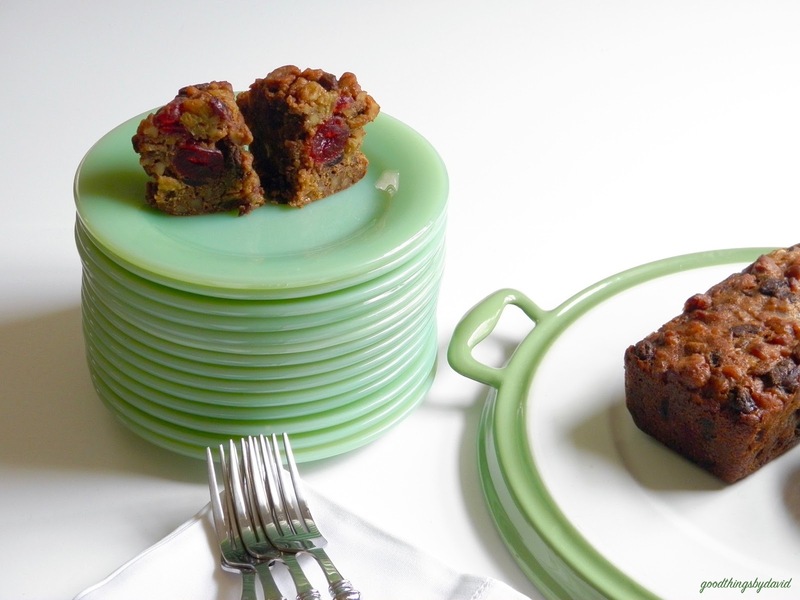 'Tis the season to partake of fruitcake. Fruitcakes have been around for millennia, and they have developed throughout the centuries based on what was available and what was allowed by religion. Countries around the world are known for their own distinct versions of this holiday sweet. 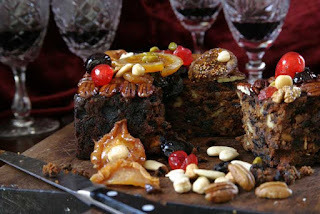 Panforte in Italy, Birnebrot in Switzerland, Stollen in Germany, Le Cake in France, Bollo de Higo in Spain, Christmas Cake in Canada, Black Cakes from the Caribbean, and our very own American Fruitcake which is rich in nuts, candied fruits, brandy or other liqueurs. My very first memories of fruitcake were from the time I was around five years old. My father's cousin, Rachel, and her son would bring us homemade fruitcake several weeks before Christmas, and although us kids never ate any, mom and dad loved having it. I can still see my cousin Peter walking up our driveway holding that small loaf of baked-from-scratch fruitcake. The thing that seemed odd to me, though, was how our cousin would only give us half of a large loaf. I suppose cousin Rachel thought it was more economical and best to hand out cake halves to the family. Who knows? During winter I crave a slice of fruitcake, but as much as I vow to make my own every Christmas, I never seem to make the time for it. It's my fault, really. To get the craving out of my system this year, I decided to try a fruitcake that several of my friends recommended. The fruitcake from Wendy Kromer Confections is really good! Made with butter, sugar, eggs and flour, each cake is packed with scrumptious raisins, walnuts, pecans, cranberries, glaceéd cherries, figs, molasses, allspice and bourbon. I have to say that the addition of dried figs seem to make these extra tasty. 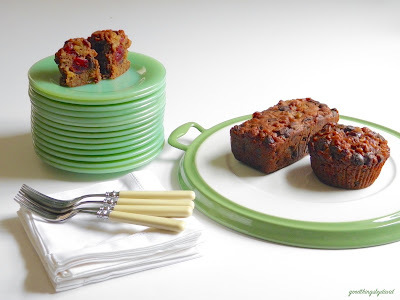 In my opinion, rich fruitcakes don't require any embellishments. They are best served as is and in small slices. A cup of tea is always nice though with a helping of fruitcake, but so is coffee. If you're ambitious enough to bake your own fruitcakes every winter and perhaps would like to try a new recipe handed down through the generations, I highly recommend that you bake my friend Andrew's. 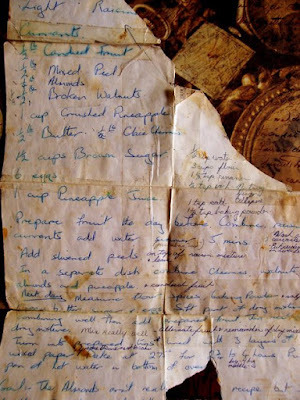 His recipe for Christmas Cake has been in the family for almost one hundred years. It gets baked every single winter by the Ritchies, who have made it a tradition to involve the entire family when mixing the batter. Each family member adds an ingredient to the bowl, giving it a good stir, and then makes a special Christmas wish before the cakes are baked in the oven. It's a time honored practice for the family. Here is the original, handwritten copy of that delicious recipe. As you can see, it has been used quite a bit by members of Andrew's family. This dark, rich cake is studded with fruits and nuts. Click here to get the recipe. I hope that many of you have a bit of fruitcake this Christmas season. As much as one can joke about these desserts, they really are delicious if made with great care and quality ingredients. You may end up making your own fruitcakes this year or being the recipient of one, so remember to give them a special place on your holiday dessert table. Enjoy! Thank you, David! I'll add Wendy's to my recipe repertoire! You're welcome Andrew. 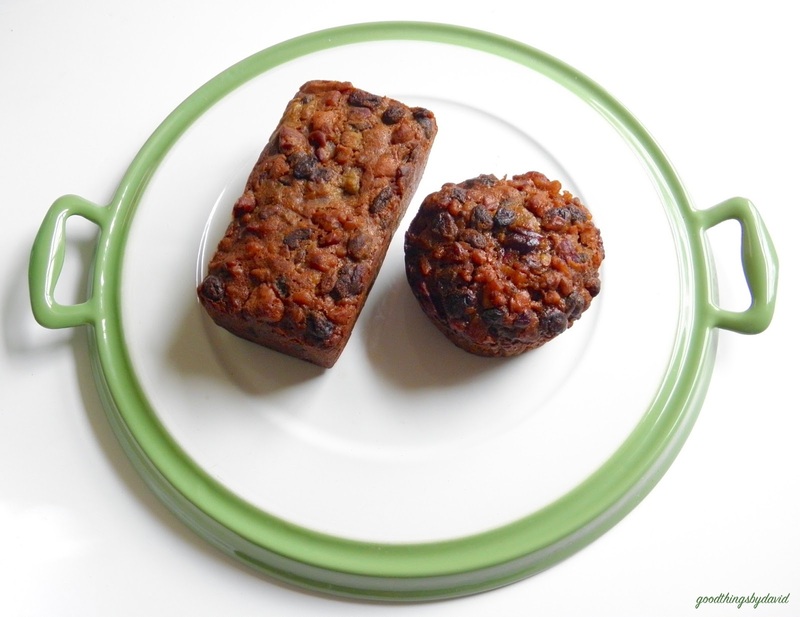 You have to try Wendy's fruitcake! Such a sweet story; I like that as a Christmas tradition. My mouth is watering. I love homemade fruitcake.